Harrisburg and Dover (the next entry up) were uniquely difficult, but for well intentioned reasons. You see, America for Jesus was going on in Philadelphia those same two days. I’d spoken at the last one on the National Mall in 2004, when the founder of AFJ, Bishop John Gimenez, a friend and a sweet brother, was still with us. John passed into glory five years ago. This time around, his son-in-law, John Blanchard, was trying to find a place for me on the dance-card, but with all the plates spinning (typical for large-scale events) that didn’t happen. No big. But, since we'd scheduled ourselves to be close by geographically during these two days (just in case), most all of the church/prayer-leader hosts we would typically connect with were already in Philly at the event, and therefore NOT in Harrisburg or Dover. We had just one brother join us in Harrisburg, but a great brother...a pastor and psalmist named David Rosen, a friend whom I’d first met 11 years earlier up in New England. The open door at the top of the stairs is the Governor's office. But the three of us we weren’t the only prayer warriors at the Pennsylvania State House. 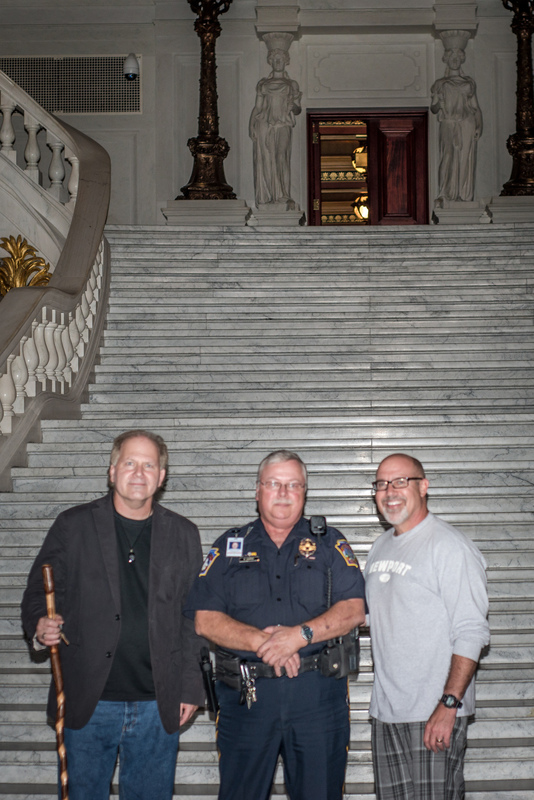 After praying on the steps of the Capitol late that night, I noticed a police guard inside and walked up to the glass door to “sign” a thank-you to him for letting us linger. Without noticing, I’d had us praying in full view of a “No entry beyond this point” sign the entire time. (Dork alert.) Not only wasn’t he upset, but he motioned us inside. We had a chance to pray with and for him, and his family. Nothing like blessed assurance! Suffice it to say this "chance" meeting with a humble brother was TRULY a divine encounter. Thank you Rick, for the sweetest evening so far! And thanks, David, for the awesome time and the great Chile Relleno at La Fiesta!